This article is about blocks as a whole. For the empty unbreakable block occasionally known as Block, see Empty Block. For the move with the same name in Paper Mario: Sticker Star, see Guard. —Wario, Wario Land: Shake It! Blocks are a staple of many platformers and RPGs in the Mario franchise. In fact, they were so successful that blocks are now a great part of the platforming genre for most video game series. Blocks often release coins and items (particularly power-ups) when hit from below or ground pounded from above. Blocks are also commonly used as a platform to get to places, but some, such as the Drop Block, may have negative side-effects when stepped on, making it difficult to traverse them. Blocks have many other uses: they can grow, shrink, recover health, give the player tips or change the level to benefit or harm the player in some way. Some blocks will break when hit, but most will simply become inactive Empty Blocks. The first block that appeared is the POW Block in Mario Bros.. The POW Block damages all enemies on the screen, making it useful if the player gets swarmed with enemies. 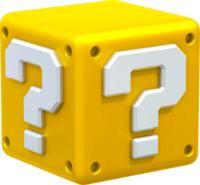 Super Mario Bros. introduces the two most common blocks in the Mario series: the Brick Block and ? Block. Some Brick Blocks releases coins when broken, and others are only breakable by Super Mario. ? Blocks usually release power-ups, such as Super Mushrooms, or Fire Flowers. Brick Blocks and ? Blocks appear in almost every Mario platformer since, and new blocks have usually been introduced in every new platformer, from the Note Block in Super Mario Bros. 3 to the ! Block in Super Mario World to the Egg Block in Yoshi's Island. In Mario RPGs, blocks release either items or coins when hit, similar to their platformer role. In most Mario RPGs, a Save Block must be hit so the player can save the game. Heart Blocks could also heal the player, sometimes for a fee. Super Blocks and Shine Blocks also play a role in upgrading the abilities of partners. In the Paper Mario series, Yellow Blocks and Stone Blocks are obstacles that must be shattered by the Hammer and its upgrades. Yellow Blocks can be destroyed by all hammers, but a Super Hammer is required to destroy a giant Yellow Block in Paper Mario: The Thousand-Year Door. In Paper Mario, Stone Blocks are destroyed with the Super Hammer, but are destroyed with the Ultra Hammer in The Thousand-Year Door. Metal Blocks can be shattered by the Ultra Hammer only in Paper Mario; in The Thousand-Year Door they usually serve as puzzle elements. In Mario & Luigi: Superstar Saga, the battle system features commands in the forms of blocks Mario and Luigi can hit to confirm. Additionally, the blocks from Super Mario Bros., Super Mario World, Super Mario 64, and Paper Mario appear together in a room in Woohoo Hooniversity, being studied by the professors. The names of their respective games are mentioned in their descriptions when hit, but the blocks do not give any coins or items. Mario & Luigi: Bowser's Inside Story introduces living blocks. The game also introduces characters made out of blocks like Broque and Broggy. They own a shop where Bowser can buy badges and items for him. Also when Bowser collects all the Blitties he can use Broggy as a special attack. 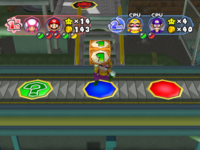 Wario hitting a Dice Block in Mario Party 6. While normal blocks do appear in the Mario Party games, the Dice Block is a special block. Characters can punch Dice Blocks (similar to how they interact with normal blocks in the platformers) to reveal a number that lets them that amount of spaces. The Dice Blocks from Mario Party to Mario Party DS are numbered from 1-10, but subsequent games changed it from 1-6 to match the number of faces a cube has. Mario Party additionally features several different kinds of Dice Blocks. ↑ Super Mario Bros. Japanese instruction booklet, page 9. This page was last edited on March 31, 2019, at 14:16.